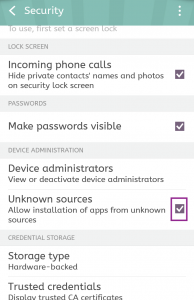 As some apps are restricted to regions outside of one’s own, an APK file can be used to obtain that particular app. 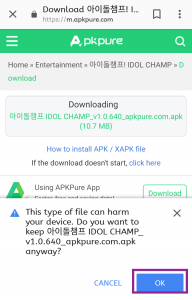 In order to be able to install APK files on your device, you must first make sure that third-party apps are allowed on your device. 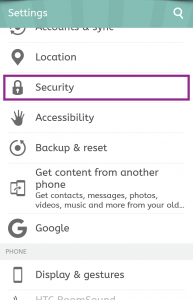 This will allow apps from places other than the Play Store to be installed on your device. Once you’ve done that, you’re ready to install the file. 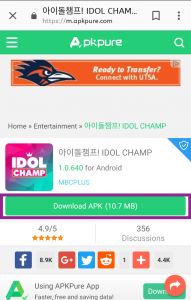 To find the app you’re looking for (for instance, the Idol Champ app which we will use as an example in this case,) type “(App name) APK” into Google, from your device. Here, we have chosen to use the site apkpure to download our file. 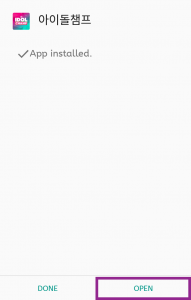 The download button is readily available and all we have to do is click Download. You will see this pop-up. Click OK and the file should begin downloading immediately. Questions or concerns, please don’t hesitate to head over to the forum and we will be happy to assist you.